When a protest is silent, signs have to speak for themselves. As DeArrius Rhymes danced around to Michael Jackson’s 1992 single “Remember the Time” playing over the Union Ballroom speakers, his friend Cameron Bailey made a sign. “TAKE IT DOWN,” the poster read, the words hugging a clenched fist raised in the air. Rhymes, a sophomore chemistry major, and Bailey, a sophomore mechanical engineering major, had worked together to trace the words and image in pencil. But now, Rhymes was taking a break, checking out other posters, while Bailey drew with careful strokes, half-inches at a time. He wouldn’t let the marker slide. The poster’s words were written in black, colored in with red. The fist was traced in green. Rhymes said the red was meant to symbolize bloodshed and draw attention, while the green symbolized taking action. 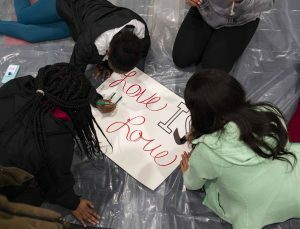 Their sign, along with dozens of others, were being prepared for Thursday’s Black History Month March to protest Confederate symbols on campus. The march, which was planned last semester, took on a new significance because of the pro-Confederate “Mississippi Stands Rally” happening Saturday. 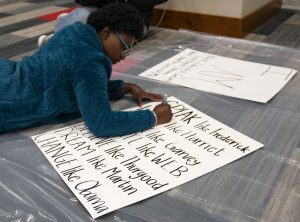 Jarrius Adams, a senior public policy leadership major and president of the University of Mississippi Gospel Choir, led the poster-making event Wednesday night. Since the march would be a silent one — from Lamar Hall to the Confederate statue — the posters would have to speak for themselves. Adams brought 50 pieces of poster board and several packs of markers paid for by alumni aware of the march’s potential impact. Shortly before 6:30 p.m., senior international studies major and UM College Democrats president John Chappell entered the room with two rolls of HUSKY plastic sheeting that he’d bought at Walmart. He and Adams spread it out so people could make posters without ruining the room’s carpet. As they rolled the sheeting out, more and more students filled the expansive ballroom. Some carried supplies. Once the center row of seats was full, Adams spoke on the logistics of the Black History Month March. Although Adams urged students to avoid campus on Saturday, he said students need to be active in demanding changes like removing the Confederate statue on the Circle. While many signs featured iconic quotes or otherwise referred to the civil rights movement of the 1950s and 1960s, others were more to the point. Victoria Robinson, a senior math major, made a sign that read “We pay $23,372/ We deserve to be accepted.” She said that, by making the problems she sees on campus into an economic issue, her message would be able to reach more people. Robinson said that making signs for a protest is important, as it communicates differently than just speaking can. “Sometimes actions speak louder than words and we can yell and project our voices, but that doesn’t show people what we really mean,” Robinson said. “Sometimes, when we write our feelings down, we’re able to articulate ourselves … so our signs speak for us when our emotions may be running high.